According IHS iSuppli, Intel has achieved its highest annual semiconductor market share in more than a decade with an overall slice of 15.6%, up 2.5% from 13.1% in 2010. Chipzilla's grasp on the market is stronger than it was in 2001, when it commanded 14.9%. The boost is largely attributed to the firm's increasingly successful microprocessor and NAND flash memory products, as well as last January's acquisition of Infineon's wireless business (now known as Intel Mobile Communications). 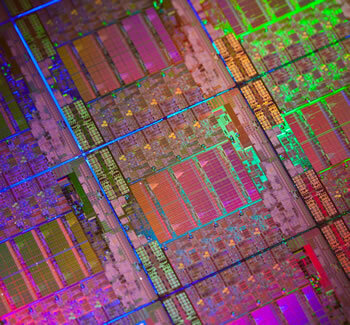 Intel's revenue increased 20.6% in 2011, far more than most major semiconductor outfits. Samsung, by comparison, trailed Intel's lead with 9.2% of the market and a 0.6% jump in revenue between 2010 and 2011 -- a relatively stagnant year for the company, which held only 3.9% of the market in 2000. Qualcomm (#6 with a 3.3% share), ON Semiconductor (#18 at 1.1%), and Nichia (#23 at 0.9%) were the only three to outpace Intel's revenue growth, with 41.6%, 49.6% and 34.1% on-year boosts, respectively. Qualcomm earned special recognition as it has experienced unwavering growth over the last decade, barring setbacks during the economic turbulence of 2009. "Because Qualcomm had successfully limited its revenue decline in 2009, it did not experience the same strong rebound in 2010 as other companies. However, Qualcomm saw its revenue and share of the market surge in 2011, taking it ever higher in the semiconductor rankings as the world’s largest fabless semiconductor supplier," iSuppli said. The global semiconductor market grew 1.3% in 2011, slightly lower than iSuppli's prediction of 1.9%. The research outfit blamed the fourth quarter's weak sequential performance of -5.9% for pulling down the annual stats, though it noted that at least the year closed with positive growth. Companies headquartered in the Americas recorded the largest revenue gains last year with a growth of 7.5%, while Japanese firms saw a 7.2% decline, partly because of 2011's earthquake and subsequent tsunami.